“We all have appointments with the past,” reads a quote from W.G. Sebald at the start of Lost in France, a startling and entertaining documentary about Glasgow’s vibrant music scene by Irish director Niall McCann. McCann’s previous features include Art Will Save the World on Luke Haines, and An Exile’s Home in the Bronx about Irish immigrants playing Gaelic football in New York. 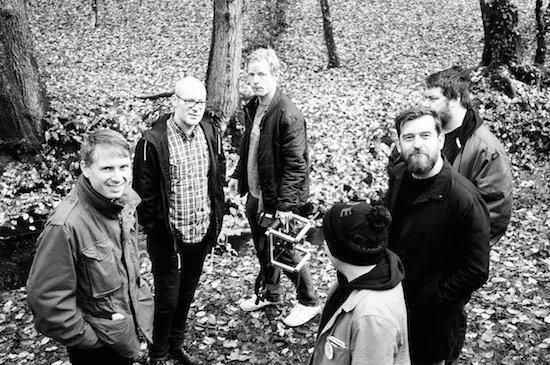 Lost in France sees a motley crew of Glaswegian musicians, including Stuart Braithwaite of Mogwai and Alex Kapranos of Franz Ferdinand, retrace their footsteps to play a reunion gig in Mauron in France eighteen years after an infamous show in 1997. “Is this us peering back into the past, or gazing hopefully into the future?” ponders Chemikal Underground Records’ Stewart Henderson in a pivotal scene. McCann blends interviews with the participants with live footage to create a funny, revealing and thought provoking film. “In 2012, I went to see Aidan Moffat and Bill Wells play the Grand Social in Dublin," he explains. "Aidan was doing his regular thing of selling merch afterwards. I'm a huge Arab Strap fan, so I introduced myself. Luckily enough, he'd seen Art Will Save the World and really liked it, so we exchanged emails and started developing an idea for a project, although it wasn’t clear at the start what the project would be. I flew over to Glasgow and spent a day with Aidan. We had a few pints and chatted about back when Arab Strap started. I was trying to find a way into the story that was a bit different and unique. Aidan mentioned this trip to Mauron and said it felt like the point everything changed from being mates in bands into something that could be a serious endeavour with a future. It was very important not just to Aidan, but to everyone who went on that trip and the scene that subsequently emerged from Glasgow. "So I spent the next few years hopping back and forth to Glasgow to convince all the guys to go back to Mauron. A lot of Glaswegians have Irish roots, and like the Irish, they don’t like blowing their own trumpet and they're quite self-deprecating. The first time I met Stewart Henderson he was under a lot of pressure from running Chemikal Underground with all the changes in the music industry over the last ten or fifteen years. The last thing they wanted to do was to look back on the so-called 'glory days'. Stewart totally downplayed the role of the label and thought Chemikal wasn’t particularly important, which is absurd. It dawned on me if I was to talk to these guys properly about their own past, I’d have to take them out of Glasgow." McCann hopes Lost in France will have a wide appeal beyond fans of Mogwai or the Chemikal Records stable. “I think because of the humour and the personal stories once you get into the cinema it doesn’t really matter if you like the music or not,” he says. “Anyone who has ever had friends and grown up with a circle of people will see a lot of themselves in it. In many ways, it's about me and my weird mates growing up in Dundalk, sitting in a garage in a housing estate with a pool table listening to these records. This is my way of paying homage to a lot of people who really changed my life. It is about something bigger about what is going on, not only in music, but in culture in general. We talk about social welfare and how it can allow people the time and space to make art, but also how attitudes to social welfare have changed. The story became a lot bigger thematically, but if you don’t have good engaging characters, then you can forget about your big themes." Niall has another music documentary in the works about Irish Maltese songwriter and Chemikal Underground artist Adrian Crowley. “Art Will Save Your Life and Lost in France are a bit like the first two parts of a trilogy and the film with Adrian is the last part,” he reveals. “Even though they're all different, they all deal with the artist living under liberal democracy and changing attitudes to art. My Luke Haines film is really about someone who makes arts for art’s sake being judged in a market economy. Lost in France is ostensibly about Chemikal Underground and the Glasgow music scene, but it’s also about how the industry has been decimated by file sharing and people not buying records anymore. For me, this is linked to the rise of liberal democracy. My film with Adrian is about the role of the artist and demystifies that role, but it also talks about how everyone is creative, even though most people think they're not. People are led to believe only some people are creative, but every single one of us are creative creatures. In my lifetime, I’ve seen the arts go from a viable career option to a hobby for so many people. If we’re not careful, we'll end up in a place with lots of bands like Mumford & Sons.